Cold brew coffee is fast becoming a super famous coffee craze enjoyed worldwide. 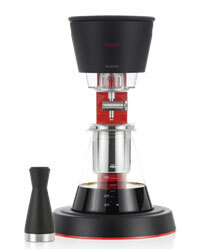 The no-heat brewing method allows for the extraction of the intricate flavours and unique characteristics, while reducing bitterness and acidity which tend to come through in heat-based extraction methods. The result: a versatile and flavoursome coffee concentrate which can be enjoyed hot or cold, in beverages, desserts and refreshing cocktails! Coffee grounds are placed in a receptive filter container while cool water is allowed to pass, ever so slowly, through the coffee grounds and into a glass container. The brewing process takes no less than 4-5 hours with a dripping rate of one droplet of water per three seconds! This gives the subtle undertones of the coffee enough time to be delicately extracted, without being lost or tainted by hot water. Try it at home with the new Izac 700 cold brew coffee dripper exclusive to Coffee Unplugged! High capacity containers for professional use. 8 selection keys with direct selection of 5 types of Drinks. “One Touch” function to prepare a cappuccino and/or latte with a single touch. Hot water wand. Stainless steel front and upper panels.